HAVE YOU EVER WONDERED WHERE YOU CAN GET FABULOUS ITEMS DIRECT FROM THE MANUFACTURER? REGISTER YOUR INTEREST TO BE A SELECT PARTICIPANT ON OUR SOURCING TOURS. Shopping is undeniably an important part of any tour. No matter wherever we go but purchasing the souvenirs and buying the small/big things is something that we all love. Shopping is more fun when we get the best quality over a competitive price. Get in touch with us, we will design the perfect tour to seek shopping of your taste. We have registered selected manufacturers / vendors through quality-check and customer reviews. To serve you the finest quality of your product in all concern. Join our tour to discover the best suppliers / manufacturers of Jewelries, Handicrafts, Souvenirs, Textiles, Tools, Machines, or whatever. Thanks. And yes we can smell the aroma of Christmas days, have a great time. This entry was posted in Roam Around and tagged camel bone articles, handicrafts, india tours, jewelries and gems, marble arts, pashmina, shopping, shopping in golden triangle, shopping tours, textiles in india on December 16, 2017 by Monks & Monkeys Travels Pvt Ltd.
Well, the most awaited festival Holi is here!! Yes, the most colorful time of the year is almost here! Do you have your Gulal ready? Or perhaps the more mischievous among you are arming yourselves with Pichkaris and water balloons? No matter your gadget of choice, it’s guaranteed to be a day of glorious color. Read on to learn all about Holi, including a legend of the battle between good and evil, why you’ll be drenched in the colors of the rainbow, and the festival’s intoxicating unofficial drink. Women, especially, enjoy the freedom of relaxed rules and sometimes join in the merriment rather aggressively. It is a time when pollution is not important, a time for license and obscenity in place of the usual societal and caste restrictions. 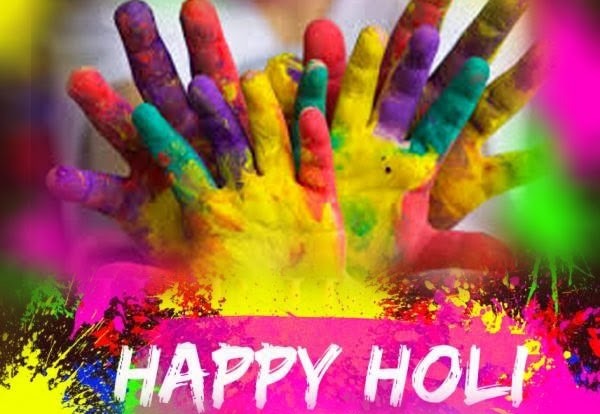 In a way, Holi is a means for the people to ventilate their ‘latent heat’ and experience strange physical relaxations. Те, кто посещал индию, не перестают с восторгом отзываться о великолепном климате, мягком воздухе, прекрасном море, безбрежном океане и золотом солнце индийских земель. Но ничто не может сравниться с праздничными ритуалами, возведенными индусами на пьедестал божественного поклонения. И, пожалуй, самым ярким из них является ритуал празднования Холи, приходящийся на конец февраля – начало марта, фестиваля юной весны, безудержного буйства красок природы, расцвета новой жизни и светлых надежд. Своими корнями история праздника уходит в далекие времена создания легенд и сказаний. По одной из таких легенд, название праздника берет свое начало от имени коварной демоницы Холики, принявшей свою смерть в оковах огня Вишну. Именно поэтому буйство огненной стихии костров по праву украшает этот праздник, а чучело, сжигаемое в огне, символизирует приход новой жизни. Согласно другому поверью, Кама, бог любви, спешит поделиться этим необыкновенным чувством с людьми. Любовный танец, полный таинства и очарования, является одной из основных традиций этого праздника, прочно соотносимой и с именем любвеобильного Кришны. Холи – самый бесшабашный, красочный, разноцветный фестиваль и конец зимы. Индийцы бросают цветным порошком в знакомых и незнакомых, поливаются цветной водой, танцуют, обнимаются, устраивают потешные сражения и веселятся. 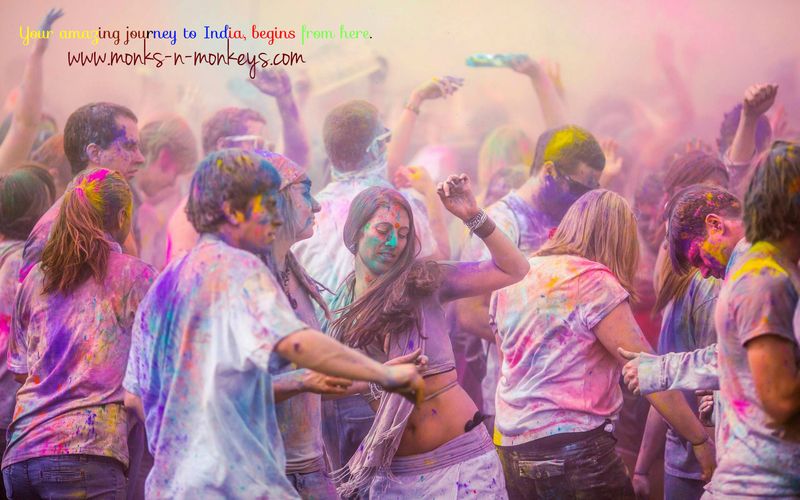 This entry was posted in Roam Around and tagged Colourful India, Festival tour, Festivals of India, Holi on March 9, 2017 by Monks & Monkeys Travels Pvt Ltd.
Hello guys!! How have you been lately? I am uploading most of the blogs on Rajasthan itself cuz i am very much influenced by it. New Year Tour in Rajasthan from Monks n Monkeys was an unforgettable experience. Driving in Rajasthan in India has its rewards. A slight detour off the road from Jodhpur to Udaipur, led us to the magnificent Jain temple of Ranakpur. Its around only an hour from Udaipur but with the Aravali Hills around makes us feel as though we are miles away. Jainism is a religion who’s main belief is of non violence towards any living thing. This includes the tiniest living micro-organisms to insects and larger species. They also try not to injure plants…root vegetables are not eaten as pulling up these vegetables involves killing the entire plant. Honey is also forbidden as its collection would amount to violence against the bees. The Jain temple at Ranakpur dates back to 1439AD. This date has been inscribed into one of the 1444 carved marble pillars that supports the many turrets, domes and cupolas…all of them marble…..the entire temple is constructed from beautiful white marble! As you enter the temple, You are taken back by the sight of all these beautiful marble columns. The carvings are exquisite. Incredibly, no two columns are alike. There’s twenty nine halls within the temple complex and as well as the main temple, Chaumukha Mandir there are two other smaller temples and a sun temple. Carvings like the one below can be find in the temple. You can see how intricate the work is in the close up picture. One of the priests will welcome you to the temple by marking your forehead with a mixture of sandalwood coloured with saffron. They will also offer their services as a guide to show you around the temple in return for a small donation. I can recommend it…it’s definitely the way to learn about the intricacies of this magnificent temple. Have you been to Ranakpur? If no, visit monks-n-monkeys.com n get your tour tailored. This entry was posted in Roam Around and tagged Chaumukha mandir, rajasthan tours, ranakpur temple, temple of India on February 23, 2017 by Monks & Monkeys Travels Pvt Ltd. Being in such a beautiful Travel planning company, I was fortunate enough to witness many of the wonderful places of Rajasthan, the land of maharajas. So today I am gonna list my favorites out of Rajasthan and you guys are requested to comment below your pick ups from Rajasthan and let me know your experience in Rajasthan. With Indian Tourism reinventing itself state-by-state, there are a few gems that always top your must visit list – one of them being Rajasthan for sure. My trip to the magical land of Kings was one of its kind, I was fortunate enough to travel with company’s specially designed “New Year’s Eve in Dessert package” . Whenever I feel lonely or disgusted with my daily routine, I extract myself out from the barriers of my home and proceed on a short trip to rejuvenate my senses with fresh energy. Recently I visited Rajasthan, which is popularly known as “the land of Maharajas (Kings)”. Each and everywhere I found distinct qualities of sculptural art that flourished in the palaces, forts and royal halls, constructed at different times by the great rulers. In addition to these, the warm friendly people and their lifestyle and the rich and varied culture of Rajasthan fascinated me a lot. Since you’d be at the gateway to Thar, you just can’t afford to miss the camel safari through the sand dunes. The Jaisalmer Fort crowns the town with its sand-coloured walls and houses an old museum, telling stories of the royalty. The city is also peppered with beautiful Havelis built by wealthy merchants. The most famous of these Havelis is certainly the Patwon-Ki-Haveli, which is an absolute must-visit for its intricate architecture. Visit this place on the new year eve, celebrate your new year on Sam Sand Dunes, the Thar dessert. I bet you, this is going to be unforgettable. A tip: It is time for you to be happy-high on some bhang! Don’t get me wrong this just my personal suggestion 😉 Foreigners better buy some rum or any other alcohol, local bhang is not recommended for you. 2. Udaipur : The city of Udaipur offered me a warm welcome throu gh its magnificent marble palaces, forts, and conspicuous lakes as well as beautiful gardens. I visited the imposing City Palace, where I found interesting areas like Suraj Gokhada, Sheesh Mahal, Mor Chowk, Zeena Mahal, Darbar Hall etc. Next, the ornamented decorations of the Jagdish Temple and the serene outlook of the Lake Palace mesmerized me a lot. Get a boat ride, roam around around Lake Palace and other finest service providing properties of India. A few other places that might interest you are the stunning Jain Temple of Ranakpur and the Fateh Bagh Palace, which is now a heritage hotel. 3. Jaipur: Being the capital of Rajasthan, and a practical getaway for many, Jaipur is the most frequented city by tourists. And while you may be here for all the shopping and the Hawa Mahal, don’t miss out on the grand Amer Fort and the royal City Palace. If you’re a reader, plan your trip specifically for the month of January, as it brings with it the much sought-after Jaipur Literary festival, which is being organised in January, from 21st to 25th, this year. Also visit the festival for the deluge of musical variety it offers. My suggestion: Try the elephant ride at the entrance of the Amer Fort instead of the usual walk-up. 4. Ajmer-Pushkar : My 2014 year’s visiting place in Rajasthan was to the city of Ajmer. Later I knew that it is the final resting place of the great Sufi Saint – Khwaja Moinuddin Chisti. I paid my homage to Garib Nawaj here and also saw the Adhai-din-ka-Jhonpra. The Taragarh Fort and the Ana Sagar lake were also the other interesting places of Ajmer where I enjoyed a lot. Next the holy town of Pushkar is not so far from here, which is home to famous Brahma Temple and Pushkar Lake. But I recommend to visit Pushkar while Pushkar fair is going on. 5. Jodhpur : I set out for Jodhpur by the same company’s new year tour. I heard from the common folk that this city is known as the ‘Sun City’. The impressive and formidable structure of the ‘Mehrangarh Fort’ gave me the idea about the defensive steps partaken by the Rajput warriors during the mediaeval periods. Apart from that, the rich decorations of the Moti Mahal, Phool Mahal, Sheesh Mahal, and the Daulat Khana kept me enthralled. The other charming places of Jodhpur I visited were the Jaswant Thada, Girdikot, Sardar Market and the 20th century Umaid Bhawan Palace which is so fascinating. About the rural people: Please meet the local people who are very friendly by nature. As they are bred and brought up in a rough and tough atmosphere, they are very strong both physically and mentally. They still regard themselves as the descendants of the mighty valiant heroes of Rajasthan. The rural people of Rajasthan carry on their livelihood through various professions like agriculture, cattle-breeding and pottery. One of the most beautiful and diverse states in the country, it sure has something for every visitor who comes here. Majestic forts and beautiful palaces, rolling sand dunes and hot air balloons, stories of hauntings and equally scary experiences, coupled with the warmth of the locals make up this exquisite treat called Rajasthan! Words can not define Rajasthan. Come & visit. This entry was posted in Roam Around and tagged best of rajasthan, exotic rajasthan tour, india tour, rajasthan on February 1, 2017 by Monks & Monkeys Travels Pvt Ltd. Welcome to a very special new column! Whenever it comes to food or travel – we all are choosy and we all have our own choices. So today I am gonna list my favorites out of Incredible India, comment below your pick ups and let me know your experience in India. So, here’s a list of 10 of my favorite places which as per my view serves life changing experience. I recommend them to visit when you are young. Disclaimer: This isn’t just for men! Places are not being ranked here, this is just a personal perception. Well, I don’t know why but I had to put Kasol in this list. 2014 was the first & only time when I visited Kasol with 3 of my friends. Two of them were purposely there to smoke the natural stuff however I am not a big fan of smoking but I definitely enjoyed the place. The road leading to this popular hill station is so nerve-rackingly dangerous that every time our bus took a sharp turn, I looked out the window with trepidation. “Avinash said. “Because of its increasing popularity among tourists, maal in Kasol is getting expensive. We get 20 grams of top quality hash for 1,800 rupees. Kullu Valley is famous for top-quality charas which is sold namely as Malana Cream. The rates may go very high depending on the quality. For me Kasol is not about getting high but a place where you can taste Israeli food, buy Bob Marley tshirts, picturesque sights n whatnot. I recommend to travel solo at least once in your life – Not only will you discover a new you and find a direction for yourself, but you’d return with experiences of a life time. And there’s no better place than Kasol to begin this adventure. I’ve never been to Andaman but Andaman is the name which makes me feel great. Are you scared of water? Maybe it’s time to beat the fear out of you and dive in to the deep sea and overcome the fear of water and depths. Trust me, you’d be delighted at the sites underwater and it will keep you coming back for more. And if you are aqua lovers, it is no less than a paradise! Thinking about Andaman, reminds me of movie “Zindagi Na Milegi Dobaara”. Because of my Uncle living in Mumbai, I get to visit Mumbai with family. Mumbai never sleeps, it lets you live a carefree life. Mumbai is about its people, the spirit of enjoying the nightclubs and of course Bollywood. Live like a mumbaikar, Have vada pav and sip a chai on your way to the locals. Yeah! Truly a must visit place. I have already had enough of this place but it deserves to be in our list. Taj Mahal needs no introduction, Tourists across the world visit India just to witness the spectacular symbol of love. See, Delhi has much more to visit- my favorite place is definitely Akshardham temple but its all about experiencing something new. So I recommend you to enjoy your gateway to the city of Ghalib, Dilli. While you’re still young, explore the cultures of your magnificent country. A stop at Hazrat Nizamuddin’s Dargah for a live Qawwali session will leave you mesmerized because it left me for sure. Geographically it is the complete travel package – It has everything from serene beaches to scenic hills, from tea & spice plantations to dense forests & calm backwaters. Apart from scenic beauty, it is popular for Ayurvedic treatments, classical dances – Kathakali & Mohiniattam, Kalaripayattu & of course, it’s delicious cuisine. To all the nature lover’s out there. A trip to God’s own country is a must in your twenties for its enchanting wilderness. Unarguably, Goa has to be the amongst the first few places to visit in India in your twenties. Young and energetic! Amazing nightlife, variety of booze, Goa has everything to make a trip memorable. By any standard and from any perspective, the Leh Manali journey is amazing. With roads that open up for only a few months a year, these 470 km will test you, scare you, shock you and leave you spellbound. You will believe life is beautiful! Leh – Ladakh is on every travel enthusiasts list of places to visit in India before they turn 30. Ride on the crazy winding roads, get stuck in the middle of no where, sleep with the locals and learn to be independent on the desert mountains as you undertake this adventurous journey. Allow your spirit to soak in the raas-leela of Vrindavan. The place that celebrates Krishna’s living philosophy. The festival is ecstatic to say the least and festival of colors here would the best you’d experience ever in your life. HoliTour. So what are you waiting for? Just pack your bag and leave town. whatever you’ll explore today will last a lifetime with you. Don’t forget to comment & subscribe!! This entry was posted in Roam Around and tagged Durga Pooja celebration, Kerala - God's own country, Leh Laddakh highwayu, marine drive Mumbai, Nizamuddin Dargah, party in Goa, scuba diving in Andaman, top ten places to visit in india, travel to India, Trip to Kasol on January 24, 2017 by Monks & Monkeys Travels Pvt Ltd.
More of The widely known Golden Triangle! You are awesome and i am sure this year is yours, you will do wonders. So just don’t forget to smile each morning. Words are all i have for you – to make you smile. “Pack yourself a toothbrush dear, pack yourself a favorite tshirt / blouse. Take a withdrawal slip, take all your savings out. Cause if we don’t leave this town, we might never make it out.” – Sleep on the floor by The Lumineers. The golden triangle of North India is the most highlighted travel package in the list of all the travel planners. Tour the “Golden Triangle” covers the most famous and most interesting cities of Central India. This is the route Delhi — Jaipur — Fatehpur Sikri — Agra. More sightseeing than the Golden triangle, perhaps, difficult to find. Cities like Agra, Jaipur, Delhi are major tourist centers of India and store a lot of interesting places, historical monuments and architectural masterpieces of the times of the Mughal dynasty. The most vivid city can rightly be called the Pinkcity – Jaipur. This small but incredible city was built according to the Canon of ancient Indian architecture: a rectangular plan with narrow picturesque streets, filled with people, shops and stalls, surrounded by a fortified wall that protected the city from raids and wild animals. Most of the historical monuments of the city built of pink Sandstone, symbolizing hospitality. The most colorful attractions in Jaipur can be considered as the Palace of winds (Hawa Mahal) and City Palace complex. The Hawa Mahal is a truly fabulous place, specially built for the harem of the Sheikh in the form of a honeycomb. This layout was designed by the architects to a wonderful resident and not be afraid to be seen, to observe the life of the city. City Palace complex is not less interesting. You will have to spend almost the entire day to explore palace. The Palace itself consists of many interesting museums, which exhibits musical instruments, items of clothing and samples of textiles, collections of ceremonial weapons, ancient manuscripts, miniature replicas of famous Indian monuments. In the city in early November, held a Grand celebration of Diwali or the festival of lights dedicated to the goddess of love and prosperity, Lakshmi, when the whole city light up candles, houses are decorated with lights and the sky is lit with extraordinary firework. The next gem on the tour is none other than Delhi, where you will explore not only the sights of the Old city but also enjoy the masterpieces of the British-Indian architecture of the New Delhi. In the first place offer tourists to explore the huge JAMA Masjid mosque. A beautiful building of red Sandstone and white marble is an excellent example of ancient Indian architecture. Here you can get your hands on in the pool or climb the South minaret overlooking the magical panorama of the Old town. Further — the Red Fort, built in 1648. On the territory you enter through the gate of Lahore, and then to be one of the first indoor markets Chatta Chowk. Not less interesting is the examination of the Hindu temple of Lakshmi-Narayana, named in honor of the goddess of abundance and wealth Lakshmi. The walls of the temple are decorated with carvings and images of Hindu mythology. Akshardham Temple – (My Favorite Place) If you look at the map, the Akshardham temple Swaminarayan (Swaminarayan Akshardham) is on the other side of the Jumna, opposite the gateway of India. To get to the temple you need to hand over all the gadgets. Sight of Akshardham cannot be described in words! The complex occupies a huge territory and involves the actual temple, a huge splash fountain in the form of a Lotus, ponds with fountain, all surrounded by covered galleries. For completeness, I will add some figures: outside area of the temple is decorated with 234 carved by hand columns, 148 stone elephants, 125 human figures and 42 animal figures. All figures presented in the scenes of the myths and legends of India. Water fountains were brought in from all rivers in the country. According to the official version, the construction of the temple at a cost of five hundred million (500 000 000) us dollars, collected by the followers of Swaminarayana. Akshardham, with all its strangeness, still is a traditional Hindu temple. In Delhi there are many holidays, but if you are a music connoisseur should visit here Republic day, January 26. This day is usually a festival of folk music and dances at the National stadium. Another gem of the tour “Golden triangle” is a fabulous town Agra. It is famous for yes one of the seven wonders of the world — the Taj Mahal. Among the cypress trees on the banks of the river majestically located the immortal monument of love, built by the Shah Jahan in honor of his beautiful wife Mumtaz Mahal. Unusual tomb still delights the eye with its exquisite beauty. Made of white marble, the mausoleum completes a double dome perfect shape and four minarets. The tomb of the Empress is built of marble, inlaid with precious stones, decorated with ornaments made of black marble. Another interesting attraction of the city is Agra Fort made of red Sandstone. The complex has retained its ten mtr high walls of terraces, halls, gardens and beautiful marble mosque, Moti Masjid. Here is the same explore the halls of public and private audiences, Grape gardens and the Mirror Palace. Tomb Itamad-UD-Dauly — the heart of the Arabian Park is one of the most beautiful attractions of the city. Empress Noorjahan built it for his parents. Small in size, the tomb is considered to be Small Taj, travelers hitting finishes of white and black marble, openwork panels, decorated with precious stones and unusual mosaics. The Golden Triangle Tour is much more than i’ve discribed, Come & experience!! Stay tuned to upcoming blogs. Экскурсионная программа «Золотого Треугольника» охватывает самые знаменитые и самые интересные города центральной Индии. Это маршрут Дели — Джайпур — Фатехпур-Сикри — Агра. Более насыщенной экскурсионной программы, чем Золотой треугольник, пожалуй, не найти. Такие города, как Агра, Джайпур, Дели являются основными туристическими центрами Индии и хранят множество интереснейших мест, исторических памятников и архитектурных шедевров времен династии Великих Моголов. Самым ярким городом по праву можно назвать Джайпур. Совсем небольшой по своим размерам, город был построен по всем каноном древнеиндийской архитектуры: имеет прямоугольную планировку с узкими живописными улочками, заполненных людьми, магазинчиками и лавками, окруженный крепостной стеной, защищавшей город от набегов и диких зверей. Большинство исторических памятников города построены из розового песчаника, символизирующего гостеприимство. Самыми колоритными достопримечательностями Джайпур можно считать Дворец ветров и Городской дворцовый комплекс. Дворец ветров поистине сказочное место, построенное специально для гарема шейха в виде медовых сот. Такая планировка была специально продумана архитекторами, чтобы прекрасные жительницы могли без страха быть увиденными, наблюдать за жизнью города. Городской дворцовый комплекс не менее интересен. На его осмотр придется потратить чуть ли не весь день. Сам дворец состоит из множества интереснейших музеев, где выставлены музыкальные инструменты, предметы одежды и образцы текстиля, коллекции церемониального оружия, древние манускрипты, миниатюрные копии известных индийских памятников. Форт Амбер – одну из самых знаменитых достопримечательностей Джайпура, который входит в число лучших укрепленных сооружений в Индии и представляет собой необычайно красивый комплекс дворцов, залов, павильонов и садов. Строительство крепости-дворца из красного и белого песчаника было начато раджой Ман Сингхом в 1592г. В городе в начале ноября проходит грандиозный праздник Дивали или праздник огней, посвященный богине любви и благополучия Лакшми, когда по всему городу загораются свечи, дома украшаются огнями, а небо освещается необыкновенные фейерверки. Летом здесь можно побывать на праздники Тидж, который проходит в третий день новолуния. Это довольно интересное зрелище, когда качели города украшаются цветами и листьями, в этот день празднуют начало сезона дождей. Для любителей рептилий праздник Нагпанчми будет крайне любопытен, ведь именно в этот день восхваляют это священное животное. Люди подносят к змеиным норам молоко, повсюду показывают свое мастерство заклинатели змей. Следующим пунктом экскурсионного тура станет Дели, где вам удастся осмотреть не только достопримечательности Старого города, но и вполне насладятся шедеврами британско-индийской архитектуры Нового. В первую очередь туристам предложат осмотреть огромную мечеть Джама Масджид. Прекрасное здание из красного песчаника и белого мрамора отличный пример древнеиндийской архитектуры. Здесь можно омыть руки в бассейне или подняться на южный минарет, откуда открывается волшебная панорама Старого города. Дальше — Ред Форт, построенный в 1648 году. На территорию вы попадаете через ворота Лахор и тут же оказываетесь на одном из первых крытых рынков Чатта Чоук. До сих пор здесь сохранилась ни с чем несравнимая атмосфера Индии, какой она была сотни лет назад. На прилавках можно найти самые невообразимые товары, купить украшения и сувениры, ароматические свечи, масла, ткани и одежду. Но не стоит покупать здесь ничего съестного. Не задерживайтесь долго на рынке, отправляйтесь в музей Форта, где выставлены предметы быта и музыкальные инструменты. В северной части Нью-Дели располагается площадь Коннаут — деловой и туристический центр Нового города. Здесь находятся лучшие магазины и рестораны города, отсюда начинается дорого к Воротам Индии, где горит вечный огонь в память о погибших солдатах Второй Мировой войны и проходят военные парады. Не менее интересным станет осмотр индуистского храма Лакшми-Нарайан, названного так в честь богини изобилия и богатства Лакшми. Стены храма украшены резьбой и изображениями из индуистской мифологии. Акшардхам Сваминараян – Если смотреть по карте, то храм Акшардхам Сваминараян (Swaminarayan Akshardham) находится на другом берегу Джамны, напротив Ворот Индии. Сахаджананда Свами (1781-1830) еще известен, как Бхагаван Сваминараян, основоположник направления в индуизме, известного как Движение Сваминараян. Его приверженцы поклоняются ему, как аватаре Нараяны — одной из форм Вишну и исходящего из Кришны. Чтобы попасть в храм пришлось не только разуться и сдать все гаджеты, но и вытащить все из карманов – из-за террористической угрозы проносить в храм ничего нельзя (деньги – можно).Увиденное словами описать невозможно! Комплекс расположен на огромной территории и включает собственно храм, огромный поющий фонтан в виде лотоса, пруды с фонтанами, а по периметру все окружено крытыми галереями. Для полноты картины добавлю несколько цифр: снаружи храм украшают 234 вырезанных вручную колоны, 148 вырезанных из камня слонов, 125 фигур людей и 42 фигуры животных. Все фигуры представлены в сценках из мифов и легенд Индии. Вода для фонтанов была привезена со всех рек страны. По официальной версии, строительство храма обошлось пятьсот миллионов (500 000 000) американских долларов, собранных приверженцами Сваминараяна. Акшардхам, при всей своей необычности, все-таки — традиционный индуистский храм. В Дели отмечается множество праздников, но если вы ценитель музыки стоит побывать здесь в день Республики, 26 января. В этот день обычно проводится фестиваль народной музыки и танцев на Национальном стадионе. Еще одной жемчужиной экскурсионного тура «Золотой треугольник» является сказочный город Агра. Славится он, конечно же, одним из семи чудес света — Тадж Махалом. Среди кипарисовых деревьев на берегу реки величественно расположился бессмертный памятник любви, сооруженный при Шахе Джахане в честь его прекрасной жены Мумтаз Махал. Необычная гробница до сих пор восхищает глаз своей изысканной красотой. Выполненный из белого мрамора, мавзолей завершает двойной купол совершенной формы и четыре минарета. Усыпальница императрицы выстроена из мрамора, инкрустирована драгоценными камнями, украшена орнаментами из черного мрамора. Другой не менее интересной достопримечательностью города является форт Агра, выполненный из красного песчаника. Комплекс сохранил за своими десяти метровыми стенами террасы, залы, сады и прекрасную мраморную мечеть Моти Масджид. Здесь же стоит осмотреть залы публичных и приватных аудиенций, Виноградный сад и Зеркальный дворец. Усыпальница Итемад-уд-Даулы — сердце Персидского парка и одна из самых изящных достопримечательностей города. Императрица Норджахан построила ее для своих родителей. Небольшая по размеру усыпальница по праву считается Малым Таджем, поражая туристов отделкой из белого и черного мрамора, ажурными панелями, украшенными драгоценными камнями и необычайной мозаикой. Если вам нравится наш блог, не забудьте подписаться. This entry was posted in Roam Around and tagged about india, тур "золотой треугольник", the golden triangle, tour to india, travel partners on January 14, 2017 by Monks & Monkeys Travels Pvt Ltd.